Three things strike me about this chart. 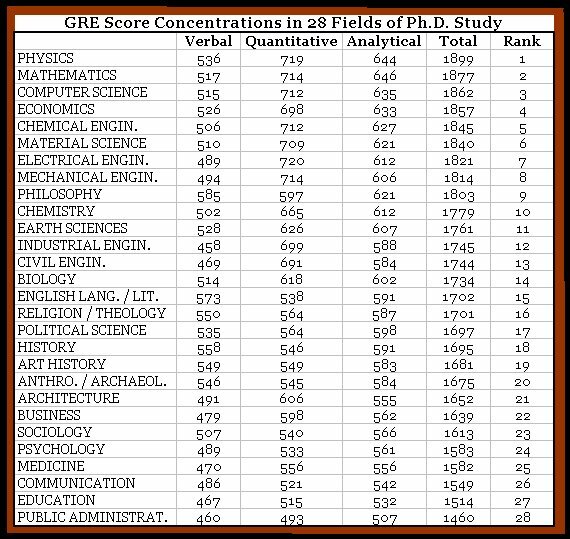 First, the total scores for the scientific disciplines are consistently higher than those for the humanities and social sciences; second, philosophy has the highest total score of the non-scientific disciplines; and third, the low ranking of education (and public administration) calls into question the seriousness of our culture — and its sustainability. Odd that medicine is included, as medical students take the MCAT and not the GRE. This list is suspect. The humanities and social science students consistently score better on the verbal section than the physicists, mathematicians, and engineers do. There are at least two important assumptions on which the blogger’s conclusions depend: first, that a standardized test like the GRE measures anything meaningful at all. Second, that the multiple-choice format is equally well suited to testing math skills as verbal skills. Both assumptions are dubious. As a biographical note, I took the GRE in 2001 before getting a PhD in classics. I got 730 verbal, 800 math, and 780 analytical. But I hated the humanities bull**** and now I’m in computer software. The only major change looks like philosophy jumped from 9th to 3rd. 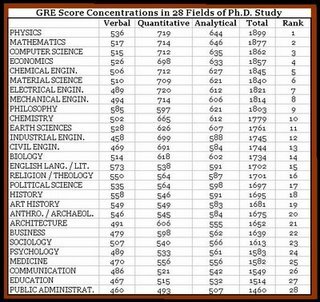 GRE Scores by Discipline | Detached Ideas great article thank you. I came here from google. After reading Brilliant ideas om your Blog. I adore.